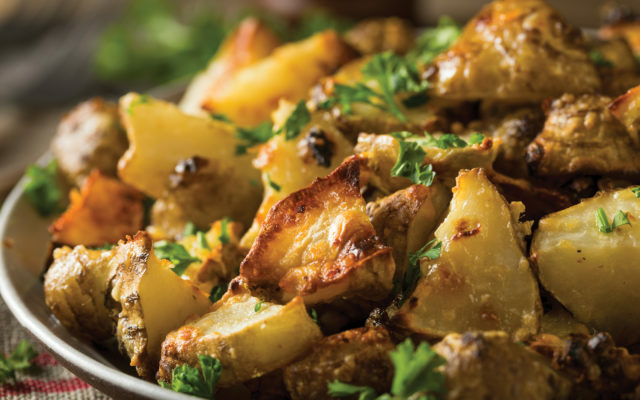 Enjoy this recipe for easy, roasted sunchokes. Call them earth apples, Jerusalem artichokes or sunchokes. Take your pick from these monikers or any number of others given this tan-brown tuber. But whatever you call them, try them. Sure, they might look like a robust knob of ginger root … or a different sort of potato. But sunchokes are an entirely different tuber altogether. The flavor varies depending on whether you are eating them raw or cooked. Raw, they are bland with a crispy texture not unlike a water chestnut. Cooked, they have a creamy texture and a flavor with notes of sweet red potatoes and earthy artichoke hearts. They can be eaten either way. But when you try them, it’s important to remember to enjoy them in moderation. See, while these are mighty tasty, overeating sunchokes has been known to cause painful discomfort in the form of gas and other stomach ailments. You’ve been warned. Still, don’t let that scare you away. These are worth trying — the creamy texture and pleasant flavor when roasted is delightful. Rinse the sunchokes under cold water, scrubbing lightly to remove any dirt. Cut into quarters and add to a large mixing bowl. Drizzle with olive oil and season generously with salt and pepper. Toss well to combine. Then pour onto a nonstick baking sheet, taking care not to over-crowd them. They need their space to cook well. Cook for 35-45 minutes, stirring once or twice. Enjoy immediately.